The ankylosaurs, or armored-plated dinosaurs, first appeared in the Kimmeridgian (~156-152 my) of the Late Jurassic, and persisted 91 million years until they became extinct at the end of the Cretaceous (65 my). They had a global distribution, including Antarctica (Gasparini et al., 1996). As fossils, ankylosaurs are most abundant in upper Lower Cretaceous strata (Barremian to Albian, ~127-98.2 my) and in upper Upper Cretaceous strata (Campanian and Maastrichtian, ~83.5-65 my) (Carpenter, 1990, 1997a,b; Carpenter and Kirkland 1998; Carpenter et al, 1999). Not surprisingly, these intervals also mark their greatest taxonomic diversity. The specimens from the Upper Cretaceous include some exceptionally well preserved skeletons with much of the armor preserved in its original position (Carpenter, 1982; Maryanska, 1977). Ankylosaurs from the Kimmeridgian of Colorado and Wyoming include two taxa, Gargoyleosaurus and Mymoorapelta from the dinosaur-rich Morrison Formation (Carpenter et al, 1998; Kirkland and Carpenter, 1994). These two taxa belong to the primitive ankylosaur family Polacanthidae (Carpenter 2001), first identified from the Lower Cretaceous of Europe (Mantell, 1833). One member, Gastonia, is perhaps the single most abundant ankylosaur known. It is represented by thousands of elements from three bone beds, as well as a few isolated occurrences, in the Cedar Mountain Formation of eastern Utah. One monospecific bonebed contains a minimum of 22 individuals (Carpenter, in preparation). Minmi is an enigmatic ankylosaur from the Lower Cretaceous of Australia. It is more derived than Scelidosaurus in having a skull that is wider than tall, closed opening in front of the orbit and atop the skull, and a nearly closed hip socket. However, it lacks any of the derived characters that would place it in one of the three ankylosaur families (Carpenter, 2001). Ankylosaurs underwent their greatest evolution during the Cretaceous (142-65 my), especially in the northern hemisphere. The Early Cretaceous was especially momentous for ankylosaur evolution in that two ankylosaur families, the Nodosauridae and Ankylosauridae, first appear in the fossil record (Carpenter 2001). Their synapomorphies, however, indicate a much longer evolutionary history, with ghost lineages possibly extending back to the Middle Jurassic (Carpenter 2001). The slight temporal overlap between the Nodosauridae and Polacanthidae in the Cedar Mountain Formation (Lower Cretaceous) raises the possibility of competitive extinction of the polacanthids by the end of the Aptian (Carpenter 2001, fig. 21.11). Nodosaurid taxa dominate the ankylosaur fossil record in the late Early Cretaceous (Aptian-Albian, 121-98.5 my) and middle Cretaceous (Cenomanian-Santonian, 98.5-83.5). Many of the nodosaurid occurrences are from marine deposits. These specimens represent carcasses of individuals that were carried to sea from their near-shore coastal plain habitat. The absence of ankylosaurids from marine deposits suggests a preference for more inland or upland habitats. Since nonmarine strata are rare for the middle Cretaceous, the observed dominance of nodosaurids may be more apparent than real. Nevertheless, this dominance changed during the latest Cretaceous (Campanian-Maastrichtian, 83.5-65 my) when ankylosaurids increased in diversity and relative abundance. They are especially diverse in Asia, where nodosaurids are as yet unknown. In marked contrast, ankylosaurids are unknown in Europe. The Asian and North American ankylosaurids are known from both arid (eolian) and lowland coastal environments. The extinction of the ankylosaurs at the end of the Cretaceous does not appear to have been abrupt. Both their relative abundance and diversity shows a decline during the last three million years of the Cretaceous in North America (Carpenter and Breithaupt, 1986), suggesting that, in North America at least, they became extinct before the asteroid impact (Hildebrand et al., 1991). Ankylosaurs are quadrupedal ornithischians with a wide, low body. Their armor is typical of ankylosaurs (Carpenter, 1997a, b), and its development is so extreme in some forms, that, for example, Euoplocephalus has armored eyelids (Coombs, 1972), and Panoplosaurus and Edmontonia have armored cheek plates (Carpenter, 1990). The body armor typically consists of oval to rectangular plates, having a keel or ridge extending their length; in ankylosaurids and polacanthids, these plates may be strongly concave ventrally. Gaps between the plates and undersides of the body, as well as the legs, are encased in small, marble- to pea-sized bone armor. In the nodosaurids, the armor plates are supplemented with long spines or spikes projecting from the neck and shoulders, while in polacanthids, the armor includes dorso-ventrally flattened, triangular spines projecting laterally from the sides of the neck, body and tail (Carpenter, 2001; Gaston et al., 2001), and in ankylosaurids, the armor is supplemented by a large bone club on the end of the tail. The skull of ankylosaurs has traditionally been thought to have armor fused to its surface (e.g., Maryanska, 1977; Sereno 1986; Carpenter 1997a,b). However, new evidence indicates that the "armor" is partially (Vickaryous et al., 2001) or entirely (Carpenter et al. 2001) the result of remodeling of the bone surface. Hence, the term "ornamentation" is preferred to "armor" in referring to this surface texture. The ornamentation apparently corresponds to the former overlying scales (Vickaryous et al., 2001). In nodosaurids, the ornamentation consists of a few, large scale patterns symmetrically arranged on the top and sides of the skull and lower jaw (Coombs, 1978a). In contrast, the ornamentation in polacanthids and ankylosaurids consisted of many, small, asymmetrically arranged scale patterns. The overall shape of the skulls of the three families differs markedly, although there are more similarities between polacanthids and ankylosaurids (Kirkland, 1998). The skull of nodosaurids is significantly longer than wide, whereas it is nearly as wide or wider than long in polacanthids and ankylosaurids (Coombs, 1978a; Carpenter, 2001). In addition, two of the five pairs of skull openings characteristic of most dinosaurs have fused shut. 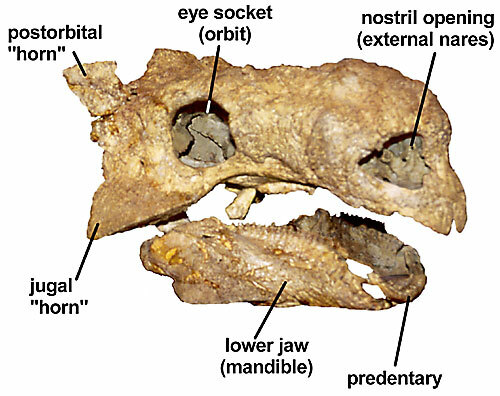 These two pairs of openings are the antorbital fenestrae located in front of the orbits, and the supratemporal fenestrae located atop the skull roof. In addition, in ankylosaurids, a third pair of openings, the lateral temporal fenestrae located behind the orbits, are also closed. Figure 1. Typical ankylosaur skull showing some of the major features (Tarchia gigantea from the Upper Cretaceous of Mongolia). Premaxillary teeth are present in primitive members of all families (Carpenter, 2001). The cheek teeth of nodosaurids tend to be proportionally larger than in polacanthids and ankylosaurids. Except in polacanthids, the base of the crown often has a shelf or cingulum on both sides. In ankylosaurids, this cingulum may be replaced by a swelling of the crown base, but in polacanthids, the primitive ornithischian non-cingulated, non-swollen crown is retained. Wear patterns on the swollen bases and cingula indicate that chewing was more complex than simple orthal adduction (Rybczynski and Vickaryous, 2001). The muzzle and beaks of nodosaurids are much narrower than those of ankylosaurids, suggesting that nodosaurids were browsers, selectively cropping plant parts or particular types of vegetation; in contrast, ankylosaurids were grazers, cropping all low vegetation (Carpenter, 1982, 1984). Polacanthids are variable, Gargoyleosaurus having a narrow muzzle and Gastonia a wider one; both share in having an unusual inverted U-shaped notch in the upper beak, the function of which is unknown. The vertebral column in ankylosaurs consists of seven or eight cervicals, about 16 dorsals, three or four sacrals, and 20 caudals in ankylosaurids and 40 or more in nodosaurids (Carpenter, 1997a) and polacanthids. The neck region is typically short, whereas the trunk is very long. The facets for the ribs are often angled upwards so that the ribs produce a wide, barrel-like body. The pelvis is also wide, with the ilium rotated into a long, nearly horizontal structure that angles away from the midline. To provide this pelvis greater stability, the posterior five or more dorsals are fused to the sacrum producing a synsacral rod. These fused vertebrae prevent rotation of the pelvis about the vertebral column. The caudals are typically short near the pelvis, and the first one or two may actually fuse to the sacrum. The caudals rapidly become elongated and in ankylosaurids the distal third of the tail may be fused to provide a rigid "handle" for the terminal tail club; in nodosaurids and polacanthids, the caudals remain long until near the end of the tail where the last three or so shorten rapidly. Figure 2. Representatives of the Ankylosauria: A) the polacanthid Gargoyleosaurus, B) the nodosaurid Sauropelta and C) the ankylosaurid Euoplocephalus. The characteristic features include a low, wide skull with remodeled surface or small pieces of armor fused to it, and a completely modified pelvis to accommodate a wide gut. The limbs of ankylosaurs are short relative to body length, especially in ankylosaurids. The scapula of polacanthids is a thin flange folded ventrolaterally towards the glenoid from the dorsal border of the scapula, whereas it is a long finger-like spur or prong near the glenoid in nodosaurids; in ankylosaurids, the acromion is typically a thickened area along the dorsal border of the scapula (in Pinacosaurus it is a polacanthid-like flange, although much smaller). The coracoid is usually longer than wide in nodosaurids, but about as long as wide in ankylosaurids and polacanthids. The limb bones are rather stoutly built to carry the ponderous body. The humerus of ankylosaurs has a well developed deltopectoral crest for several muscles involved in locomotion (Coombs, 1978a). The humerus is proportionally more slender in nodosaurids than in ankylosaurids (Coombs, 1978b) and is intermediate in polacanthids (Carpenter, 2001). The olecranon on the ulna in ankylosaurs is well developed and provides a tall lever for extensor muscles of the elbow. The pelvis is unusual among ornithischians because the ilium has expanded horizontally to form a broad, wide surface. In addition, the acetabulum, or hip socket, is not open in typical dinosaur fashion, but is cup-like, being closed off internally by the ischium and ilium; the pubis only contributes to a small portion of the acetabulum. Most of the body weight was carried over the hind legs; consequently, the femur is straight and pillar-like, and the tibia and fibula are short and stout. Both the fore- and hind-feet are short and stout as well. The femur of nodosaurids and polacanthids is more slender in build than in ankylosaurids (Coombs, 1978a). Traditionally, there has been a general consensus that the Nodosauridae and Ankylosauridae share a common ancestry among basal thyreophorans (e.g., Sereno, 1986; Maryanska and Osmolska, 1985; Fastovsky and Weishampel, 1996). The recent recognition of the Polacanthidae (Carpenter 2001) does not refute this origin. Basically, all three families plus Minmi (which cannot be placed into a family), differ from all other ornithischians in having skull surfaces modified by remodeling under the influence of the overlying skin, closure of the supratemporal and antorbital fenestrae, armor encasing the neck, body and tail, a horizontal ilium, complete or near complete closure of the acetabulum, and reduction of the pubis to a small rectangular block. Carpenter, K. 1997a. Ankylosauria. Pp. 16-20 in P. Currie, and K. Padian (eds. ), The Encyclopedia of Dinosaurs. Academic Press, San Diego,. Carpenter, K. 1997b. Ankylosaurs. Pp. 308-316 in J. Farlow and M. Brett-Surman (eds. ), The Complete Dinosaur. Indiana University Press, Bloomington. Carpenter, K. 2001. Phylogenetic Analysis of the Ankylosauria. Pp 455-483 in K. Carpenter (ed.). The Armored Dinosaurs. Indiana University Press, Bloomington. Carpenter, K., and B. Breithaupt, 1986. Latest Cretaceous occurrence of nodosaurid ankylosaurs (Dinosauria, Ornithischia) in western North America and the gradual extinction of the dinosaurs. Journal of Vertebrate Paleontology, 6:251-257. Carpenter, K., J.I. Kirkland, D.Burge and J.Bird. 1999. 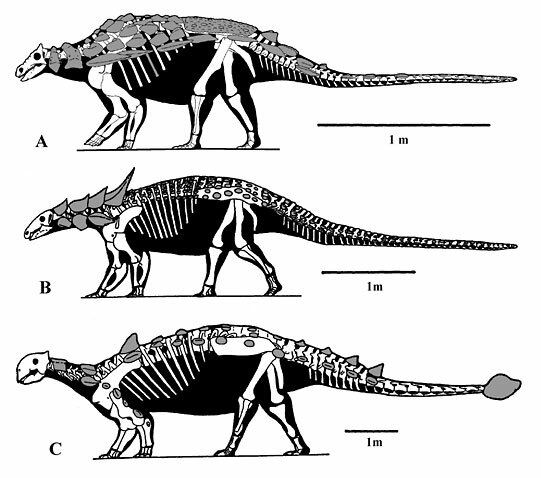 Ankylosaurs (Dinosauria: Ornithischia) of the Cedar Mountain Formation, Utah, and their stratigraphic distribution. Pp. 244-251 in D.Gillette (ed). Vertebrate Paleontology in Utah. Utah Geological Survey Miscellaneous Publication 99-1. Carpenter, K., J.I. Kirkland, D.Burge and J.Bird. 2001. Disarticulated skull of a new primitive ankylosaurid from the Lower Cretaceous of Eastern Utah. Pp. 211-328 in K. Carpenter (ed.). The Armored Dinosaurs. Indiana University Press, Bloomington. Coombs, W. 1972. The bony eyelid of Euoplocephalus (Reptilia: Ornithischia). Journal of Paleontology 46:637-650. Gaston, R.W., J. Schellenbach and J.I. Kirkland. 2001. Mounted Skeleton of the Polacanthine Ankylosaur Gastonia burgei. Pp.386-398 in K. Carpenter (ed.). The Armored Dinosaurs. Indiana University Press, Bloomington. Hildebrand. A.R., G.T. Penfield, D.A. King, M. Pilkington, A.Z. Camaro, S.B. Jacobson, and W.B. Boynton. 1991. Chicxulub Crater: a possible Cretaceous/Tertiary boundary impact crater on the Yucatan Peninsula, Mexico. Geology 19:867-871. Kirkland, J.I. 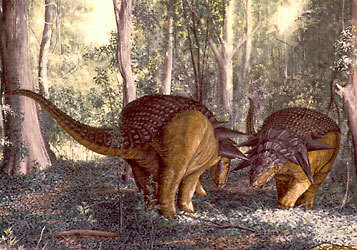 1998, A polacanthine ankylosaur (Ornithischia: Dinosauria) from the Early Cretaceous (Barremian) of Eastern Utah, Pp. 271-281 in S.G. Lucas, J.I. Kirkland and J.W. Estep (eds. ), Lower and Middle Cretaceous Terrestrial Ecosystems. New Mexico Museum of Natural History and Science Bulletin No. 14. Mantell, G. 1833. The Geology of the South-East of England. London: Longman Ltd.
Maryanska, T., 1977. Ankylosauridae (Dinosauria) from Mongolia. Palaeontologia Polonica, 37:85-151. Rybczynski, N. and M.K. Vickaryous. 2001. Evidence of Complex Jaw Movement in the Late Cretaceous Ankylosaurid, Euoplocephalus tutus (Dinosauria: Thyreophora). In K. Carpenter (ed.). The Armored Dinosaurs. Indiana University Press, Bloomington. Thanks to Katja Schulz, The Tree of Life Project, for her assistance in getting these pages designed and online, and to Brian Franczak for use of his ankylosaur restorations. The skeletal illustrations are copyright © 2001 Kenneth Carpenter. Page: Tree of Life Ankylosauria. Armored-plated dinosaurs. Authored by Kenneth Carpenter. The TEXT of this page is licensed under the Creative Commons Attribution-NonCommercial License - Version 3.0. Note that images and other media featured on this page are each governed by their own license, and they may or may not be available for reuse. Click on an image or a media link to access the media data window, which provides the relevant licensing information. For the general terms and conditions of ToL material reuse and redistribution, please see the Tree of Life Copyright Policies.